So, there we were, celebrating our anniversary at the Howard Creek Ranch in northern Mendocino County, having had our plans to ride the Skunk Train fall through due to tunnel maintenance. 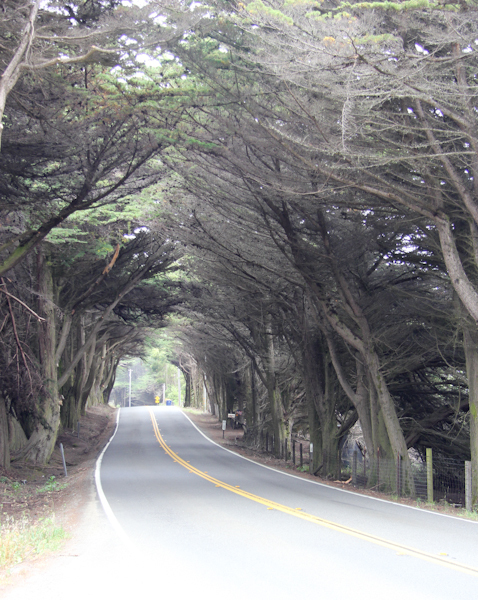 While driving up to Mendocino, Eric looked at the map and found that MacKerricher State Park was near the Ranch. 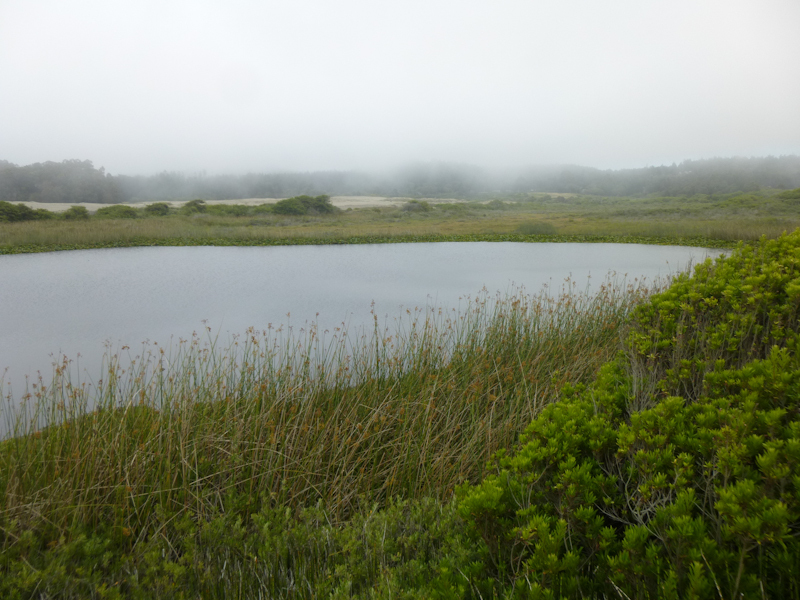 We knew nothing of MacKerricher State Park, but it was a state park, so there must be something interesting there, right? 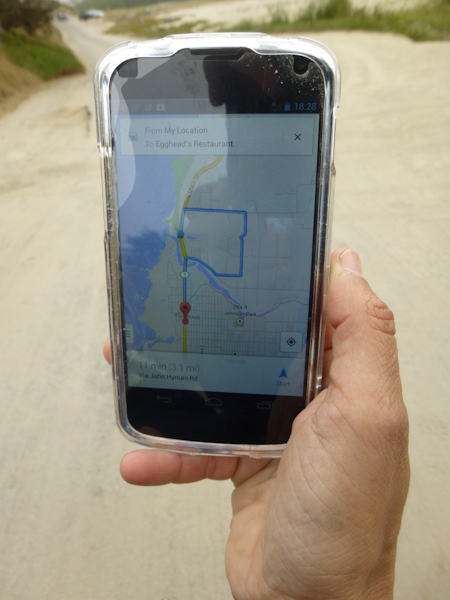 While I drove up US 101 into Mendocino County, Eric attempted to find some geocaches in the park using his phone. It was a slow and painful process, so I had to finish it in the morning using a laptop and broadband while he was in the shower. Then, of course, came the unnecessarily technically complicated phase of transferring the waypoints into the GPS. I sat rocking in a rocking chair reading The Rapture of the Nerds. Eventually, we got in Sydney and drove the relatively short distance down CA 1 to the park. Iconic CA 1. Photo by Eric. Westport-Union Landing State Beach at Howard Creek. 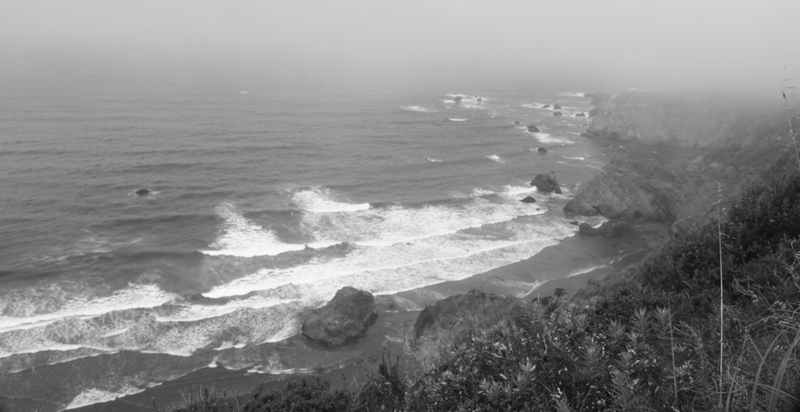 Even in early afternoon, it was so foggy that I thought the views looked better in black and white. 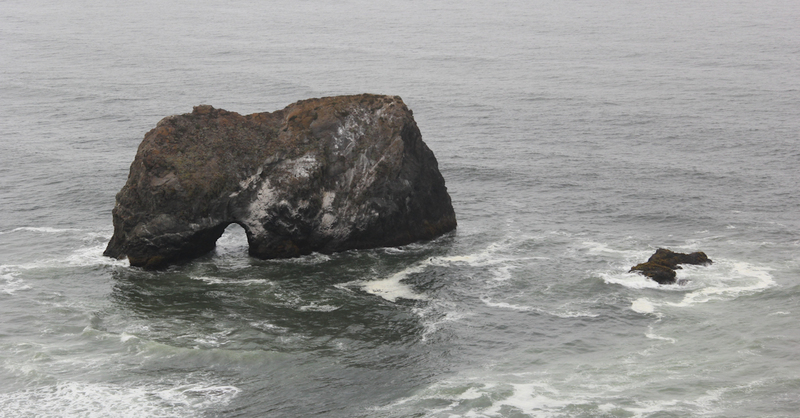 One of those cool rocks with an arch. 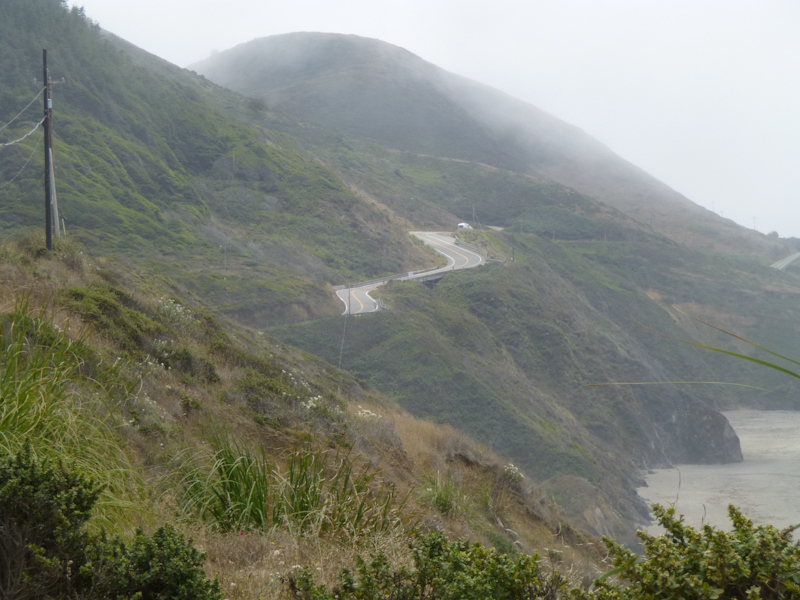 The road was amazing even when it wasn't overlooking the ocean. I drove into the park, fumbling in the door pocket for the free state park parking passes that I get for being a member of the California State Parks Foundation. We were greeted by the friendliest park ranger anywhere, who boomingly announced, "You don't need those here! Day use is free! Save those for those other parks! Hey, did you see our whale skeleton?" "No, whale skeleton? I must have been busy looking for the park passes." "Everybody misses the whale skeleton! It's right over there!" 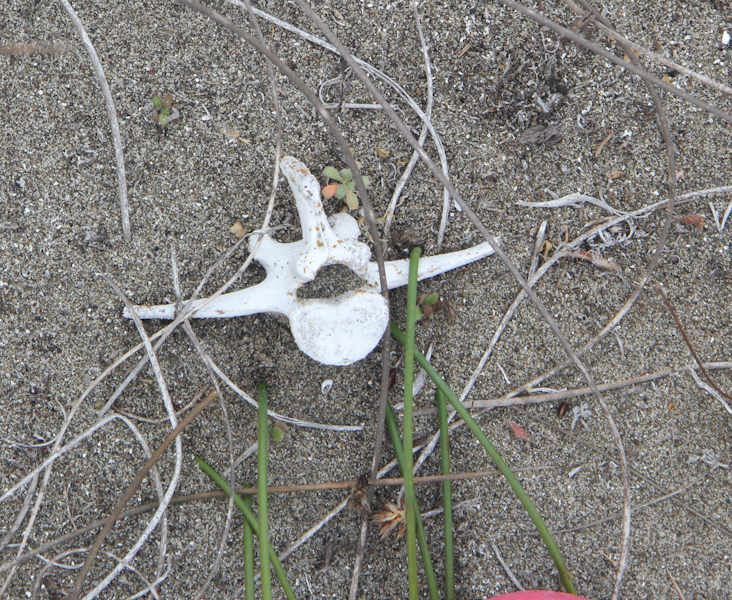 He pointed to the other side of the road, next to the Visitor Center, at a very large collection of bones arranged in the shape of a whale. He handed me a map of the park, carefully indicating the location of the open bathrooms, as some of them were closed. 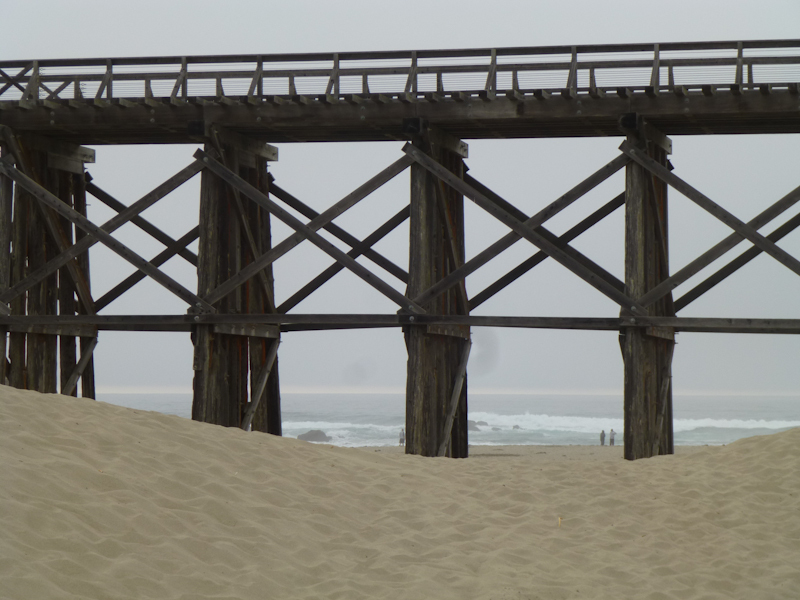 He went on to tell us that if we went walking on the beach, to stay on the wet part of the sand, because, first of all, it's easier going, and, second of all, we didn't want to disturb the nesting Snowy Plovers further out on the beach. 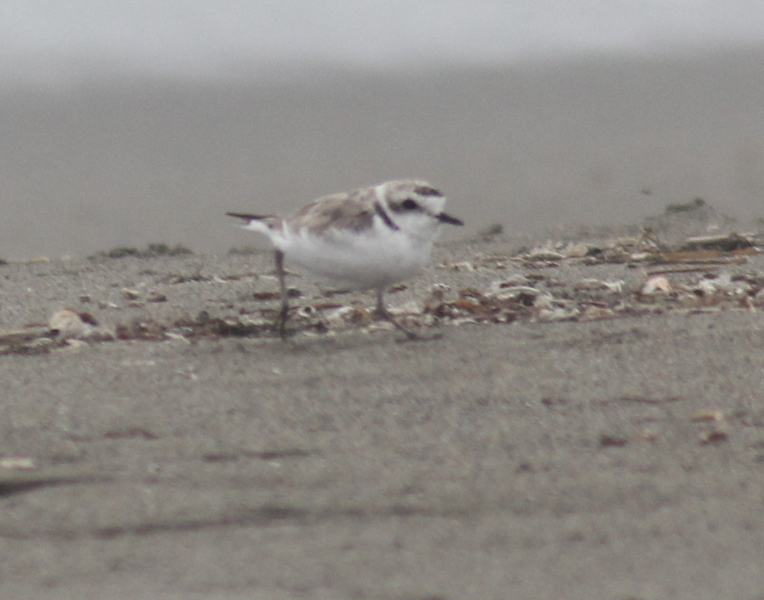 This excited me, because I'd wanted to see a Snowy Plover for a while but never had. "And make sure you have fun! Otherwise, we kick you out!" OK, then! 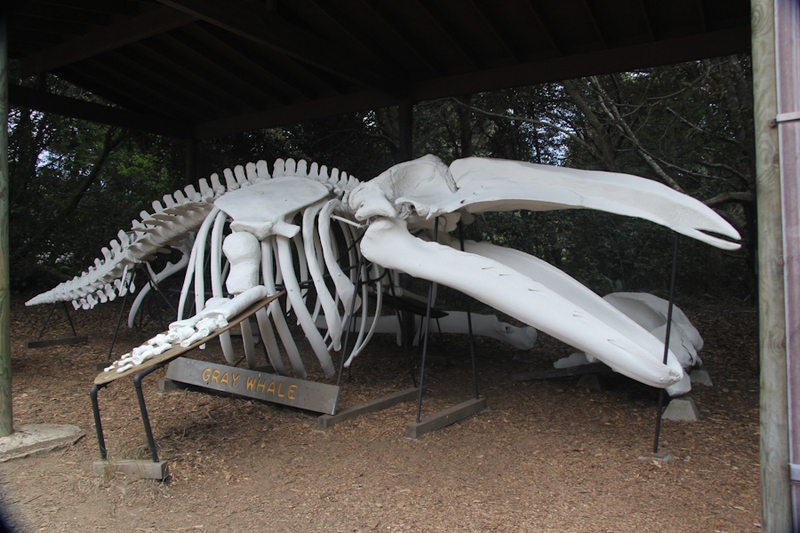 We popped into the Visitor Center to see the exhibits inside and check out the nearby whale skeleton. 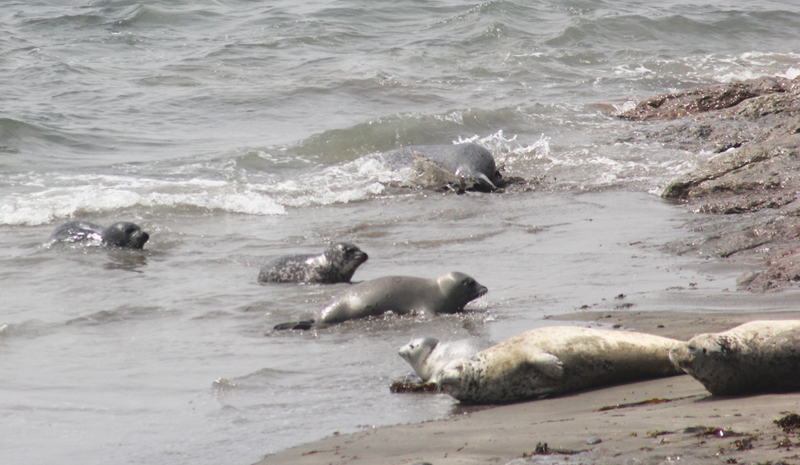 A sign indicated that there was a ranger program on Harbor Seals starting at 14:00. It was already after 14:00, but we did manage to catch up with the ranger and his program. 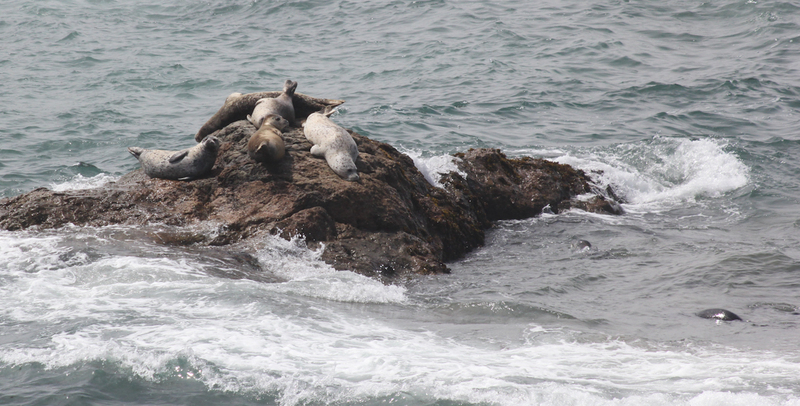 We missed the discussion about the seals, but he led us out to where we could easily see them. 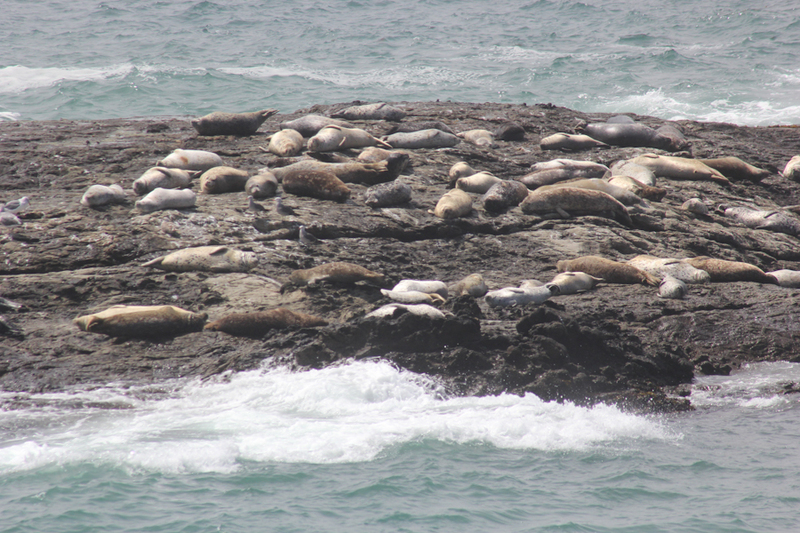 Harbor Seals basking in the hazy sunshine. Seals are somewhat clumsy on land, trying to get themselves back into the water. 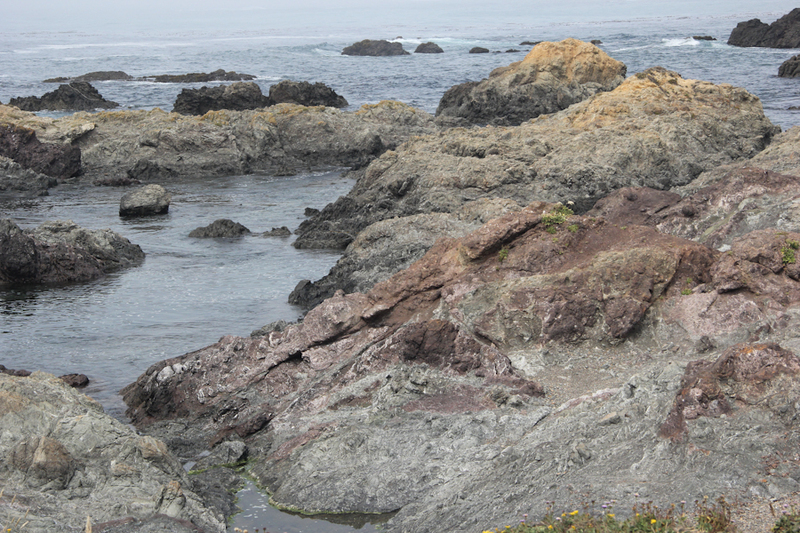 This all reminded me of our previous anniversary, at East Brother Light Station, where we also saw seals. This would be two anniversaries in a row featuring both seals and lighthouses. 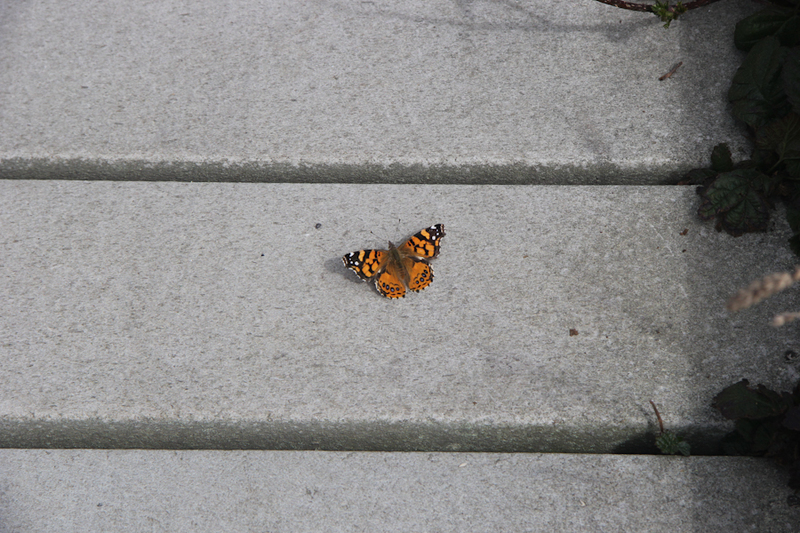 A butterfly on the walkway let us get relatively close. Trees on the hill above the path leading to the beach. If someone knows what kind of trees these are, please tell me. 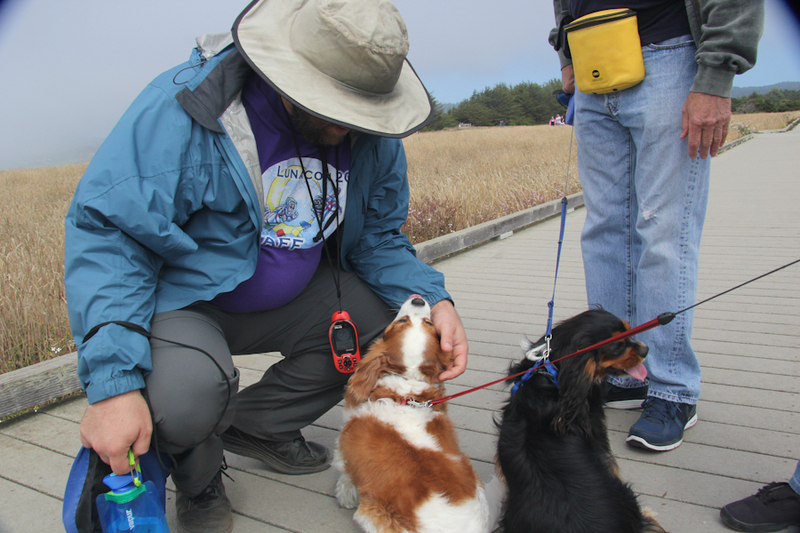 Northern Mendocino just seemed like the dog-friendliest place in the world. 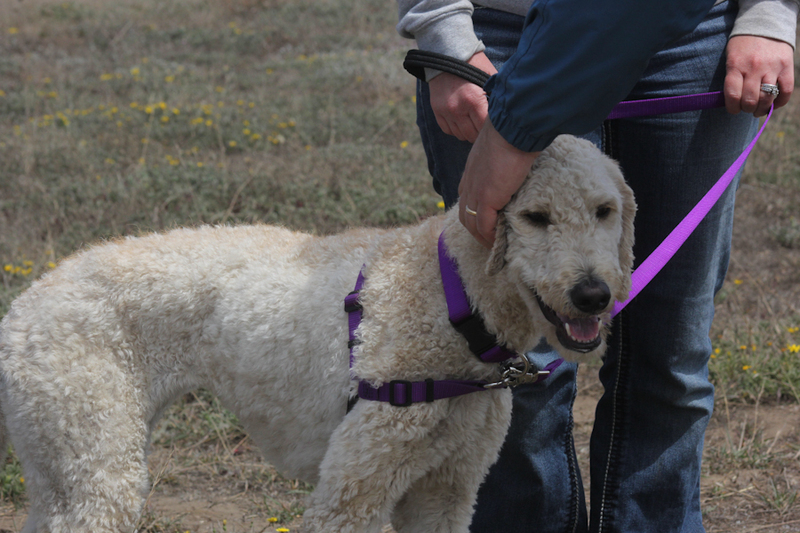 Other guests at the Howard Creek Ranch had brought their dogs, and out in the park, there seemed to be dogs everywhere. Eric, of course, needed to pet as many of them as possible. 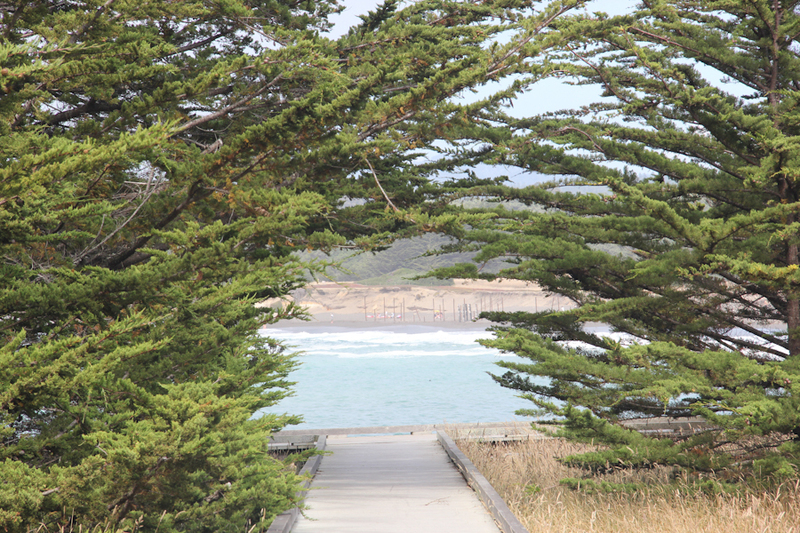 We left the boardwalked area and headed out onto the beach, in search of a geocache. 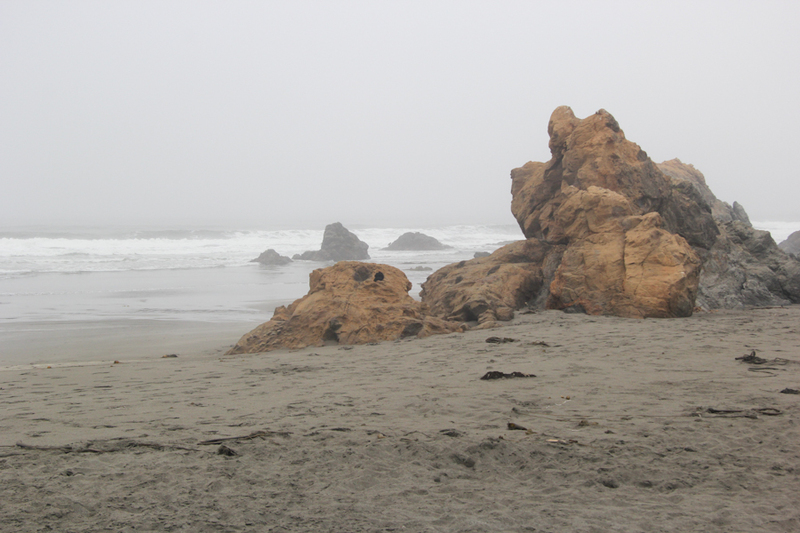 It was cold and foggy, and virtually empty. It was incredibly romantic. 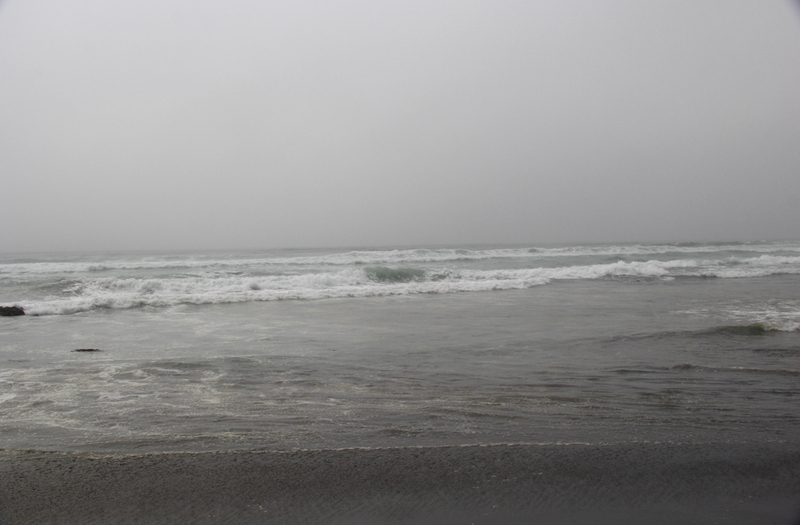 There's just something deeply comforting about the infinitude of the ocean. It touches us in a profoundly metaphoric way. 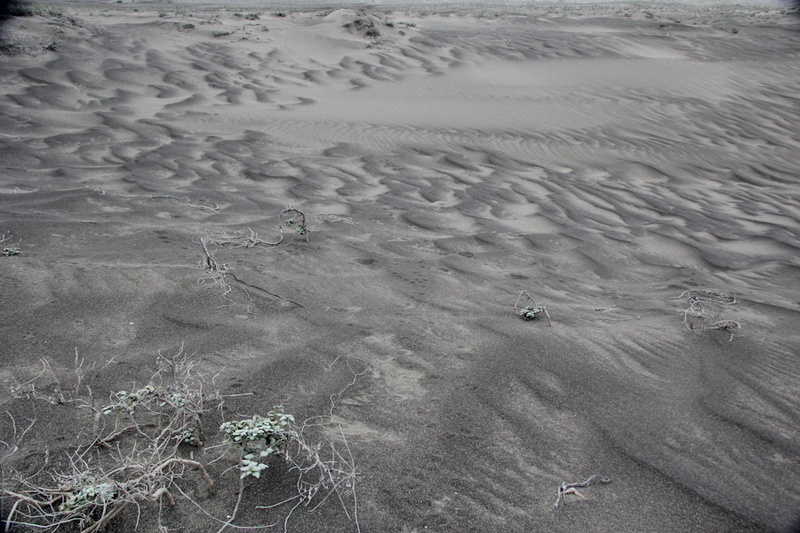 After following the ranger's instructions to stay on the wet sand for some distance, to get to the cache, we needed to turn inland into the dunes. 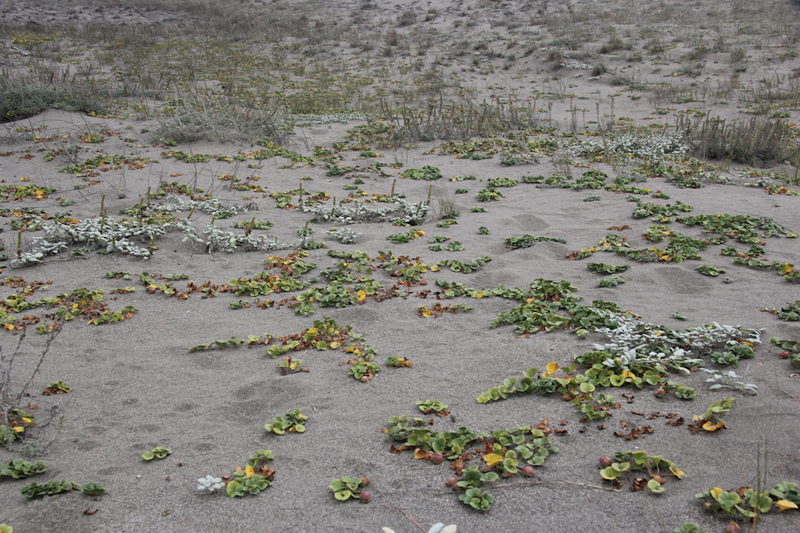 I hope that the Snowy Plovers nest close to the water. Fascinating patterns in the dunes. 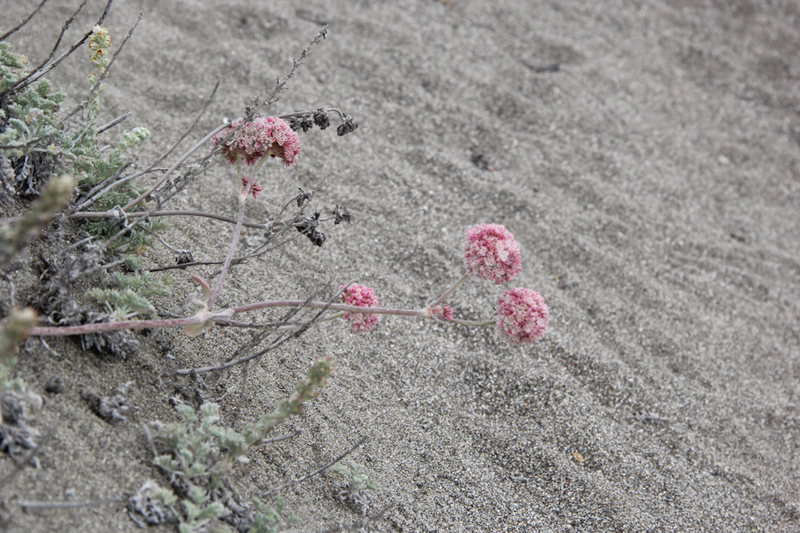 It's amazing how plants grow out there on the dunes. I tried not to step on them, because they're probably native. A vertebra! Anyone know what animal this might be from? The geocache we found was intended to bring us to this fen, which the listing asserts is the southernmost fen in North America. A fen is a particular type of wetland. It was a hard climb over the dunes to get there, but it was an interesting hike. 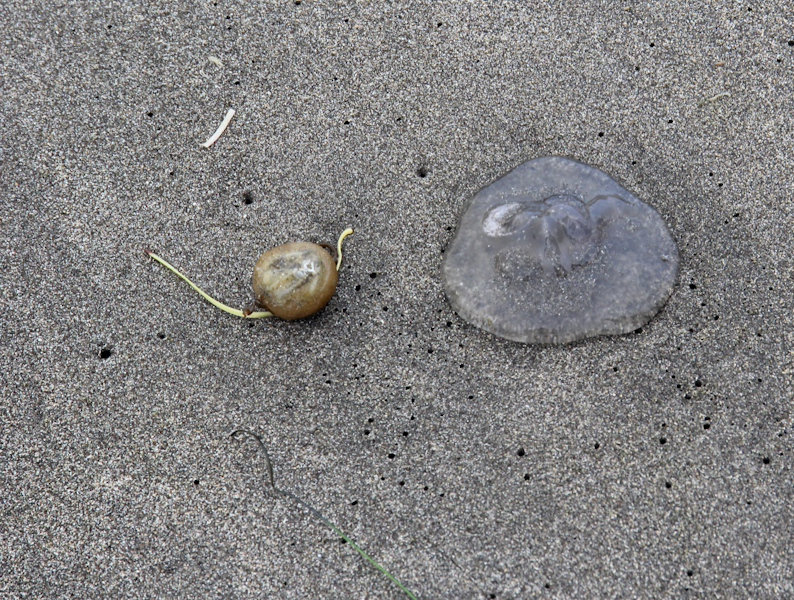 Back on the wet said, we found this jelly. 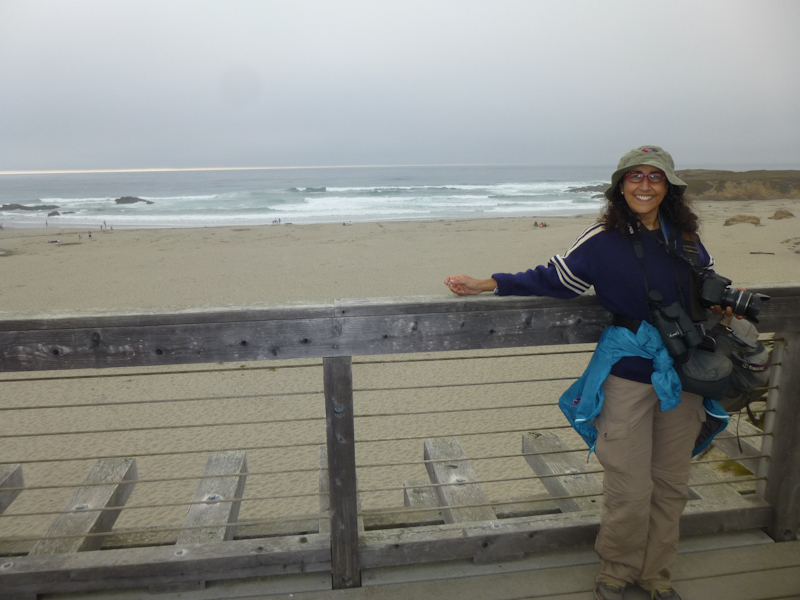 And then, at last, we saw the Snowy Plover! As we were walking back to the car, I received a text from a friend, telling me that her husband had been in a bicycle accident. 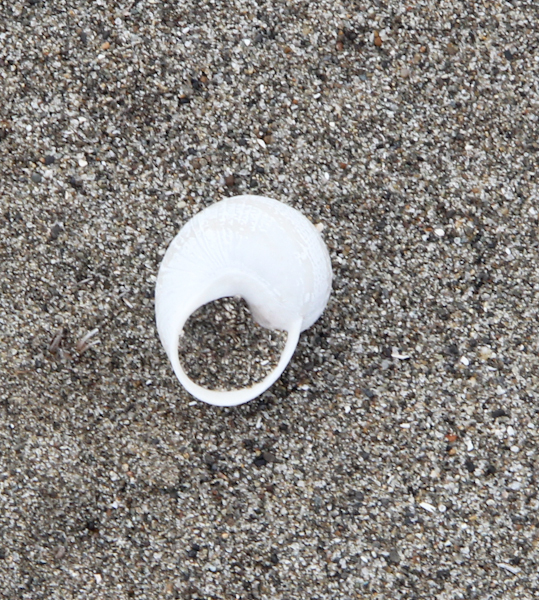 I responded that he was a resilient guy and would eventually be fine, and added, "Celebrating anniversary on beach." I thought about that last bit and figured it sounded like I should be wearing a bathing suit rather than a wool sweater! But this is northern California. We decided, for a change, to be sensible about when we left the park. We went into Ft. Bragg to get dinner while there was still plenty of light in the sky. 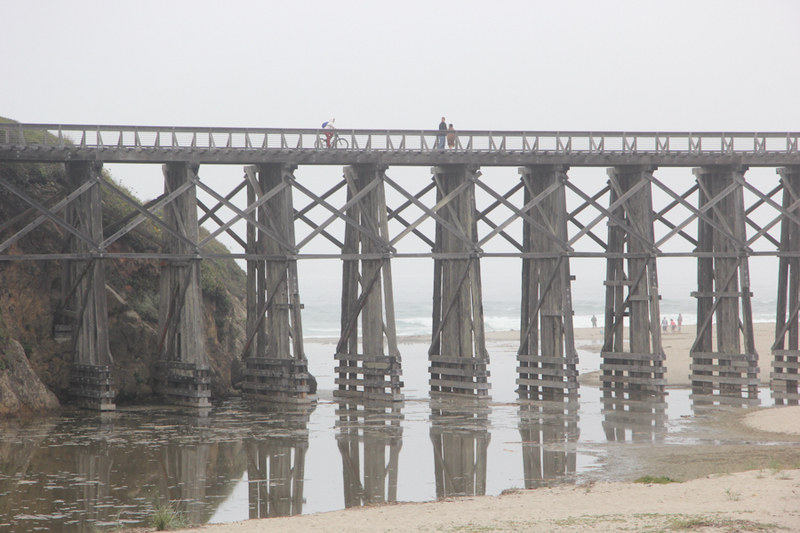 We found another cache near this dramatic bridge. Eric's view of the bridge. He also took my picture up on top. Eric under a windblown tree. 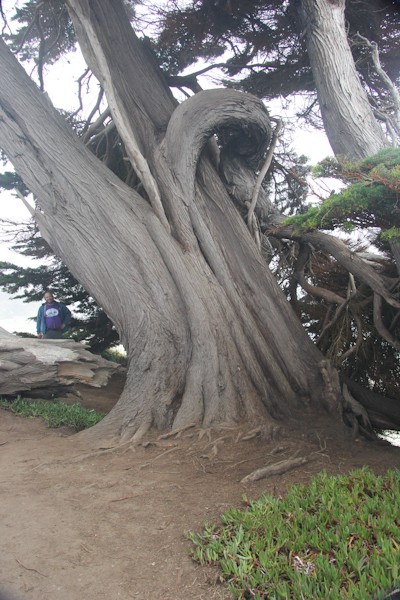 Imagine what the wind off the beach must be like to do this to a tree. I asked me phone for directions to a particular restaurant, which turned out to be just directly down the road. This is a perfect illustration of why you can't trust those things. It was so ridiculous that I had Eric take a picture of it for you. The Wizard-of-Oz-themed restaurant we had wanted to check out was only open for breakfast and lunch, so we had a nice Italian dinner across the street. Ft. Bragg is a nice little town. On to Sunday of our anniversary weekend, where we visited three state parks and two lighthouses.